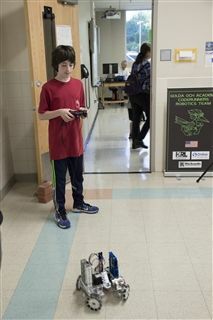 Last month, Golda Och Academy held its STEM symposium at the Eric F. Ross Upper School campus, celebrating the achievements of high school students in the Dr Lynne B Harrison STEM program and the award-winning robotics team, the CodeRunners, as well as showcasing middle school projects including robots built for the FIRST Tech Challenge. Attendees at the symposium had the opportunity to explore and learn about the capstone projects from students in the four-year, STEM program who were challenged to solve a real-world problem. 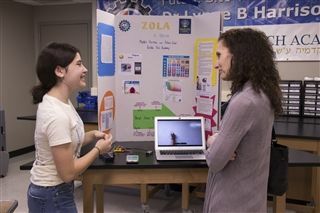 Projects included a fingerprint-activated garage door opener, a system that automatically detects water level and turns off a bath tub faucet, and a bracelet that detects UVA and UVB exposure and alerts users when to reapply sunscreen. In previous years, students have devised an EpiPen that would automatically alert 911 with GPS location when used as well as a car seat that alerted a parent when a baby was left inside after the vehicle stopped and became too hot. One of the guiding principles of STEM education at Golda Och Academy is to use science, technology, engineering and math to make the world a better place. 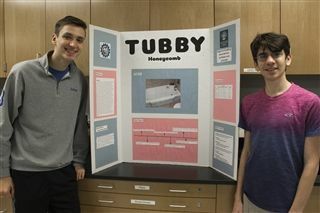 Each year, small groups create a capstone project where they receive a small budget to tackle a problem and find a solution, develop a prototype and devise a marketing plan. This past year, faculty members were invited to submit a request for a problem that needed a tech solution. As a result, one of the senior STEM class groups devised a solution to automate the student attendance system at school. Each student was given a unique QR code that they used to sign in with in the morning. An excel spreadsheet was then generated with a sorted list of absent and present students, including the time they arrived. The attendance system was piloted at school. In addition to taking pride in these innovative projects, Golda Och Academy was proud to celebrate the first graduating class of the four-year intensive engineering program. The current graduates were the first to participate under the direction of Dr. Shira Kelmanovich, who holds a PhD in Chemical Engineering from Stanford University. “I believe the high school STEM program has exposed our students to careers in engineering and technology and, as a result, has encouraged them to pursue these fields as they move on to college,” said Dr. Kelmanovich. This program has been made possible through the generous support of community philanthropist Dr. Lynne B Harrison. The school’s 4,500-square-foot Dr Lynne B Harrison STEM Center has two outfitted maker spaces − a STEM Lab and Robotics Lab − that include a 3D printing lab, laser cutter and CNC Router, enabling students to tackle challenging projects that demonstrate principles such as electricity, circuits and coding. 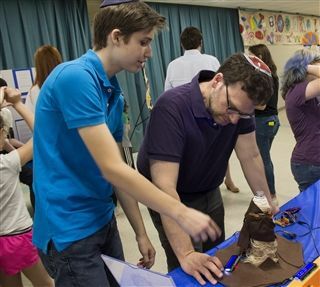 The school also has received support from Center for Innovation in Jewish Education and The Gottesman Fund.